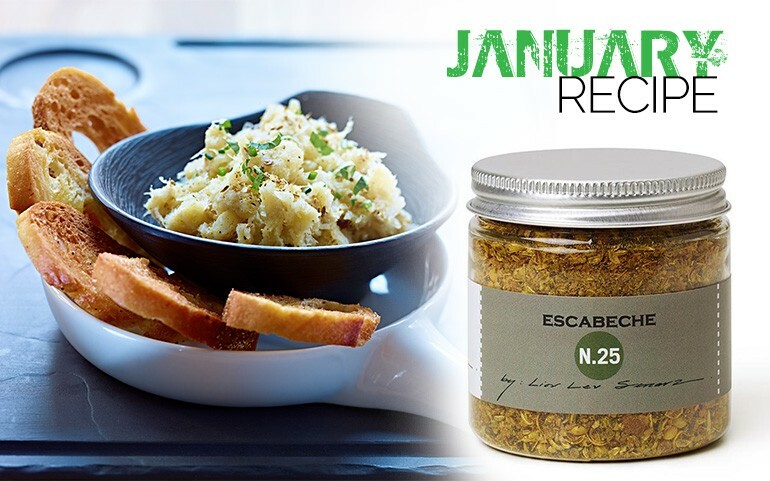 Kick off the New Year with January’s Sandy Spice, Escabeche N.25. 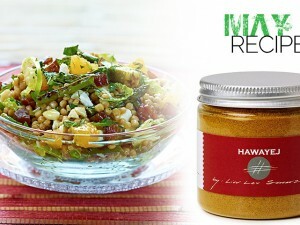 This rich Mediterranean blend is a combination of lemon, saffron, coriander, fennel and spices. Broil or grill fish with it, add it to duck, rice, and even braised beans. 1. In a bowl, mix ¼ cup Escabeche spice blend and 2 tablespoons salt. Set aside 2 tablespoons plus 1 teaspoon of this mixture. Spread the remaining mixture all over both sides of the fish, place the fish in a non-reactive metal tray or glass baking pan and cover tightly with plastic wrap. Refrigerate for 5 hours. 2. In a saucepan, cover the potatoes, garlic cloves and 1 tablespoons of the reserved Escabeche/salt with water by one inch. Bring to boil, lower the heat to medium and cook until the potato is tender. Drain, reserving the garlic, and peel the potatoes. 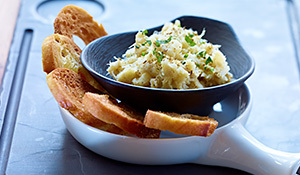 In a bowl, mash the potato and garlic together with a fork. 3. Place wine, 3 cups water, onion, chopped garlic, thyme, halved lemon and 1 tablespoon of the Escabeche/salt mixture in a pot large enough to hold the fish. Bring to a boil, lower the heat and simmer for 15 minutes. Rinse the cured cod. Bring the poaching liquid to a boil, add the fish, turn off the heat and let cook for 5 minutes. 4. Remove the fish from the poaching liquid and add to the potatoes. Flake the fish apart with a fork and stir into the potatoes. Stir in the lemon zest, parsley, chives and remaining 1 teaspoon of Escabeche/salt mixture. 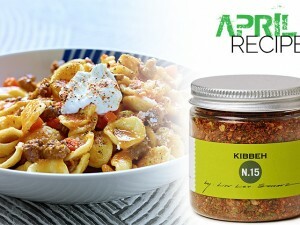 Stir in the olive oil and season to taste with pepper. Spoon the brandade over the toasts and serve. 1. Warm 1 tsp Escabeche with 1 cup of olive oil and use to slow poach salmon or tuna. 2. 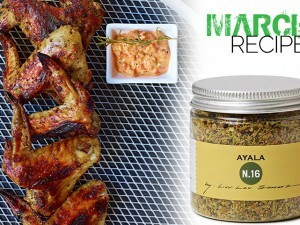 Combine with Pernod and lemon juice and use to braise thinly sliced fennel. 3. 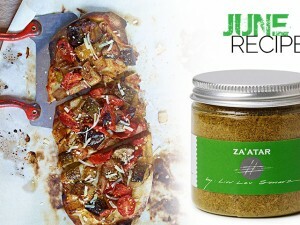 Rub Escabeche all over a pork shoulder or pork roast and bake until very tender.